The Wildlife Photographer of the Year contest’s image selection for the LUMIX People’s Choice of the Year Award is online. 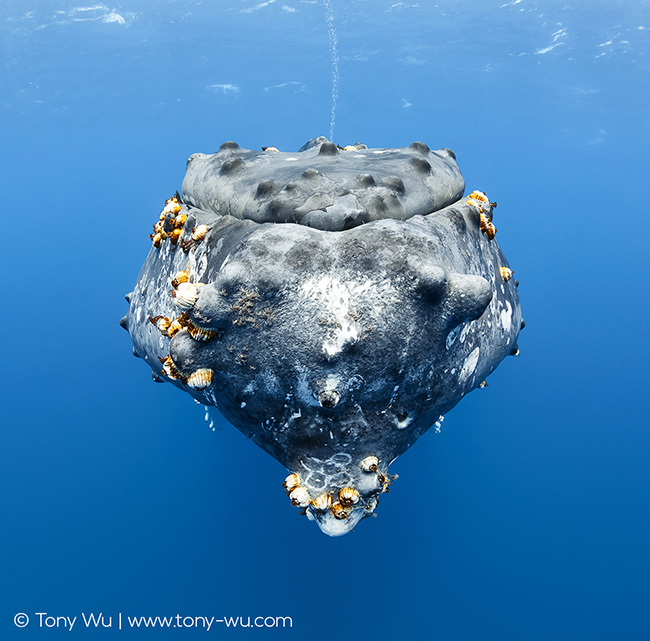 This image that I took of a relaxed humpback whale emitting a stream of bubbles is one of the shortlisted photos. I took this photo during the first of two times I met this female and her male calf. The perspective/ camera angle is straight-on at the tip of the adult whale’s lower jaw, close enough that you can see the many barnacles and whale lice populating the whale, as well as the design/ layout of the tubercles (little bumps) on her head. The tubercles each contain a single hair follicle. Though we are not entirely sure what they are for, they (1) provide a visual link to the fact that whales are mammals, and (2) are arranged in such a manner that if you consider the layout, it certainly gives the impression of a sensory network. We know that the tubercles are highly enervated, so that supports the idea that the tubercles comprise a sensory system. Finally, the stream of bubbles is really what I wanted to capture. Whales don’t sleep in the same way we do, but it’s fair to say this whale was highly, highly relaxed. I’ve seen bubbles stream like this from the blowholes of whales only a handful of times. I do not know what, if anything, it signifies, but I like to imagine that it’s a little bit like our snoring  In order for the whale to let me take this photo, she had to be completely comfortable with my presence. Actually, both she and her calf. I use the words “for the whale to let me take this photo” intentionally. Too many people understandably think, “I am going to take a photo.” One thing I’ve learned from being in the water with animals hundreds of times larger than me, and immeasurably more agile than I ever will be, is that I rarely decide anything. They do.